Belgium is a country of texture and contrasts. Beer is as important to Belgian culture and cuisine as wine is to the French. And baby, we love those Belgian beers! 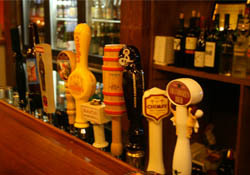 While our emphasis is on Belgian beer, we also offer an amazing selection of beers from the rest of the world. Our menu is designed to serve as a complement to this beer variety, with excellent Belgian frites, mussels, burgers and entrees. 06/01/2012 "et in Arcadia ego"